Ozone is a natural sanitiser derived directly from the air we breathe with no additives. It is produced by passing oxygen through a high intensity electrical field. In this way the oxygen gas is changed to ozone gas, a short-lived powerful oxidiser. Once generated, ozone must be used immediately as it breaks down rapidly to oxygen, leaving no chemical residue from the ozone. Ozone is very powerful and effective being many times stronger than chlorine. With no chemical additives, it does not have to be stored; you generate it on site as it is needed. 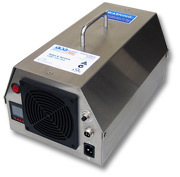 Ozone Industries' family of UV ozone systems are the finest grade of UV ozone generators on the market. The only components requiring replacement from time to time are the fan and the lamp. The lamp is rated at 6000 hours. The cabinet is made from long lasting and easily cleaned stainless steel. 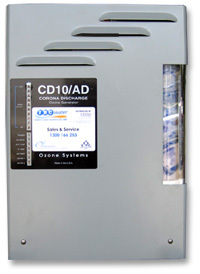 This unit is built to a commercial standard. For full information on our Ozone Industries product range, please visit our specialist ozone website. ClearWater Tech, LLC is a leading designer, manufacturer and marketer of ozone generation equipment and related components to serve a wide range of air and water purification applications and markets. Its employees have earned technical distinction in a number of key applications, with patents pending on several ozone-related products and processes. 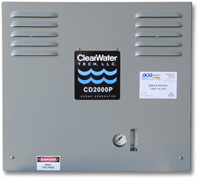 ClearWater Tech markets globally and has over 200,000 installations on six continents since 1986.